I have come to the realization that it is soooo hard for people to not judge one another. 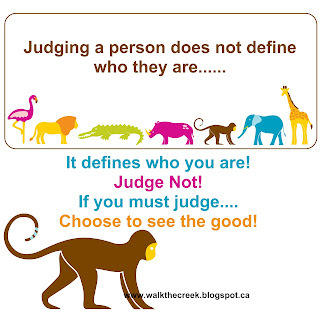 What does it mean to judge someone? Well, the dictionary defines judge as: to form an opinion or conclusion about - and in this instance I am talking about people. I don't think it is wrong to judge someone, or to form an opinion about them, but why is it that we do it without validity? We are so quick to form our opinion of someone, on meeting them for a few minutes, or something they happen to say or do, and in reality, we don't know them at all. Or even if we do know them at all, why do we always form negative or harmful opinions of them, instead of looking for the good in someone? someone would say something negative about someone or something, his dad would always turn it around into a positive instead. What a talent! Hats off to you Grandpa T.
I have caught myself more and more lately, as I see other being judgmental, trying really hard to not be that way. One of my favorite things to say to my own children when they are complaining or judging someone, is, "All we can do is make sure we do not do the thing that bothers us about that person." I keep trying to reinforce that concept on them. I sure don't want to be the cause of someone being hurt by something I have said or done that was judging or forming an opinion without all of the information to do so. Someone said to me the other day that she didn't want a certain person to do something for her because she thought that person was snobbish. 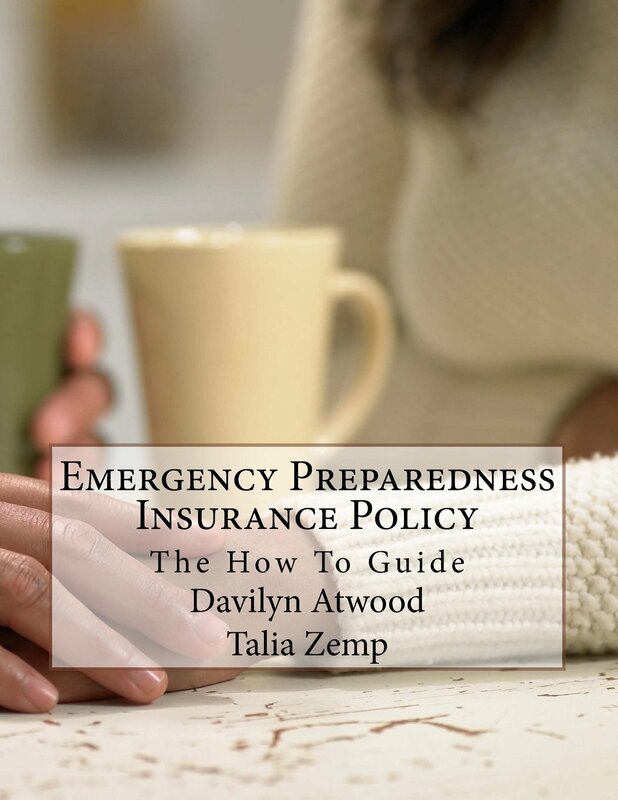 It was such a situation that it was all I could do to not say to her that it was kind of snobbish of her to even say that because she knew nothing about this person's life at all. But then I realized I was being a bit judgemental myself and so I chose not to say it, but I must admit I thought it. 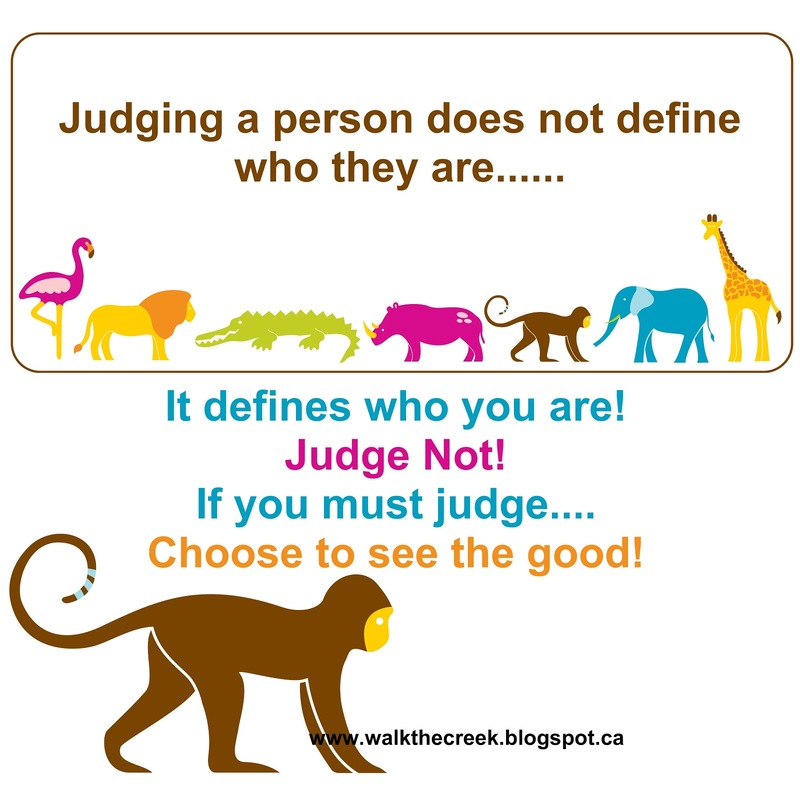 Why do we judge others? I mean there is a time and place to form an opinion, if there is safety involved and things like that, but otherwise, why is it that we mostly choose to see the negative in people instead of forming our opinions of them based on the good things? Everyone has good things if we look hard enough. Some it might just be harder to find them than others. How about we try though. I know I am going to. It hurts my heart to see such harsh judgements being passed and opinions being formed all of the time by people I know should know better. If that makes sense? I choose today to not be that person any more! I choose to not judge people or form my opinions in a negative way. I choose to look for the good, and if I am having a hard time seeing the good, I choose to not say anything at all until I can find something good to say about them. If I choose to be this person, then I hope when it comes time for my funeral, people can say about me that I chose to see the good in others and love them for who they were. That's what I want to choose. I have made enough dumb choices and formed enough uncalled for opinions in my life and I don't want to do it anymore! I choose to judge not, and leave the judging up for He who's place it is to judge.